Laura Miriam (Grimm) Allen, age 87, passed away peacefully at her home on Wednesday, August 1, 2018. Miriam was born September 25, 1930, in Wauneta, Nebraska, to Louis and Laura Mae (Gaines) Grimm. She graduated from Hastings College with a bachelor’s degree in education and was a junior high English teacher for many years. Her working years included the Drake Law School and the State of Iowa. Miriam married Charles Allen on July 20, 1952 and they were blessed with 60 years together prior to his passing in 2012. Her married years began on a farm with her husband and children, where they raised horses, dogs and hogs. She came to love that lifestyle, working in the garden, and following along with her family’s love of riding. She was a member of First Federated Church and Women’s Auxiliary of the Gideons. 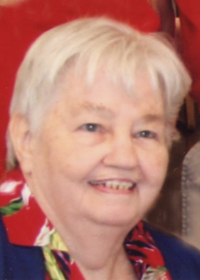 She was an avid reader, a published author, and always enjoyed attending the symphony. Above all else, family was most important to her. Miriam is survived by her loving children, Chuck (Jill) Allen of Florida, Cyndie (Jim) Norton of Des Moines, and Sue Allen of Des Moines; 14 grandchildren; 34 great-grandchildren; sister-in-law, Myra Grimm of Wauneta, NE; brother-in-law, George Allen of Lexington, NE; other extended family and many special friends. She was preceded in death by her husband of 60 years, Charles “Chuck” Allen, parents, brother and sister. Visitation will be held from 5:00 to 7:00 p.m., Sunday, August 5, 2018, at Hamilton’s Funeral Home, 605 Lyon Street, Des Moines. Funeral services will begin at 11:00 a.m., Monday, August 6, also at Hamilton’s, with a reception to follow. Services will conclude with burial at Masonic Cemetery, Des Moines at 11:00 a.m., Wednesday, August 8. Memorial contributions may be directed to Gideons International, P.O. Box 140800, Nashville, TN 37214-0800, or to the family.